The optical system of this model should give you a pointer as to whether it’s worth trying out or not, and that’s because its components are fully multi-coated, which means that you are going to be able to benefit from an excellent light transmission. 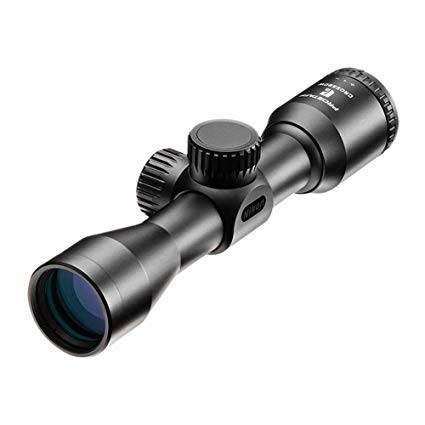 Even when you’re going to be hunting at dusk or dawn, this scope will serve you well and allow you to get your eyes on the target conveniently and comfortably. This crossbow scope does not come with a variable magnification, which is why you cannot customize it as per your needs. Its 3x fixed magnification means that you are going to move through the environment until you get a position where you can make the most of the capabilities of this device in this sense. The Prostaff P3 is a great choice if you are looking for a scope that can last you for as long as possible. The whole item is crafted from aircraft grade aluminum, which means that you are going to be able to rest assured that nothing will damage it ahead of time. This rugged tool also comes with turret caps made out of aluminum, so that’s one less thing to worry about. Based on the info provided by the manufacturing brand, this particular model is both waterproof and fog proof, so it is perfectly capable of withstanding the challenges of inclement weather, thereby allowing you to perform your hunting whenever it’s convenient for you. Nothing’s worse than an overly heavy crossbow scope, because it increases the overall weight of your hunting ensemble. You need a weapon that’s highly usable so that you can shoot your target effectively and comfortably. Fortunately, this scope weighs in at just under 11 ounces, so it won’t be a hefty (or heavy) extra on your bow. Its dimensions are 3.2 by 0.8 by 0.8 inches. 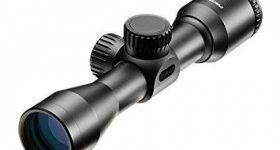 Even though you might think that this unit is less of a great option seeing how it comes with a fixed 3x magnification instead of a variable one, the truth is that you need to make a sacrifice to benefit from the best in terms of optics quality. This particular unit comes with fully multi-coated optical parts, which means that the light transmission will always be on par, thereby allowing you to hunt at dusk or dawn. The images you are going to be looking at will be crisp, clear, and bright, and it goes without saying that you’re going to be able to see your prey and mark your target accordingly. Of course, seeing how the optics are fully multi-coated, this model isn’t necessarily the most budget-friendly one ever to have seen the light of day, but you have to make a trade-off between quality and affordability. Some of the specs you need to know about this product are that it comes with a 1-inch tube, it boasts a generous 3.4-inch eye relief that allows for great user experience, and it has an eyepiece outside diameter of 41mm. The exit pupil measures 10.7 mm, and the field of view is 35.6 ft at 100 yards, so it might be a little less than what you’re accustomed to. The BDC reticle boasted by this alternative is designed uniquely for the maximization of the efficiency and range of your modern crossbow. The reticle’s 20-yard ‘zero’ offers corresponding aiming point circles for shots to 60 and over 80 yards. Of course, all of this is variable depending on the bolt velocity, but also its length, weight, and point weight. You can perform reticle adjustments in almost no time with this unit since it comes with 1-MOA click-stop that you can both feel with your fingers and hear, too. You can rest the elevation knobs to ‘zero’ after sighting in the scope so that you can perform field adjustments comfortably. Both the elevation and the windage turrets are marked clearly, so you can make swift adjustments. If you’re in the market for a 3x crossbow scope and you want it to come with excellent optical components, as well as a durable construction, perhaps you should consider the Prostaff P3. It boasts fully multi-coated optics, a generous eye relief, and a rugged 1-inch tube made out of aircraft grade aluminum. Also, performing reticle adjustments can be done with ease and in a timely fashion.